Physical Geography is a part of the Dept of Earth Sciences, in which is also included the subjects Geology, Marine geology and Oceanography. Physical Geography and Geography in Developing countries is one of the major reseach fields. Madelene Ostwald defended her doctoral dissertation on ”Local protection of tropical dry natural forest, Orissa, India” on Friday 26 May 2000. Faculty opponent was Dr Freerk Wiersum, Dept of Forestry, Wageningen University, The Netherlands. Abstract: Due to the deforestation in tropical areas where a growing population depends greatly on forest products, local protection of state-owned natural forest to promote regeneration has emerged as a form of forest management. The thesis focuses on the effect on forest and people connected to local forest protection in Orissa, India. It also explores the possibility of monitoring vegetation change by remote sensing and tests a support tool system based in a geographical information system. In the study area, local protection of natural forest promotes regeneration, without moving the pressure to adjacent forest areas. Large-scale remote sensing analyses of vegetation index showed a vegetation increase of four percent from 1992 to 1996 over both the locally protected areas and the whole forest area. Small-scale analyses showed that with ten years difference in protection, the forest had developed statistically significant greater tree diameter, height and succession, while soil properties showed few differences from only ten years. A remote sensing monitoring study was conducted using small-scale biophysical data. The result suggests that a two-class index of high and low vegetation can be statistically distinguished. The older regeneration area had 59 percent high vegetation, while the younger regeneration area had 35. The internal variations within two studied forests show signs of spatial differences related to use in the past. By combining economic and remote sensing analyses, it was shown that villages with tree plantations increased regeneration through local protection in natural forest more successfully than villages without. Dr. Ostwald is currently on leave from Göteborg University. She spends 80 p.c. of her time working as Associate Professor at the Centre for Climate Science and Policy Research (CSPR), a joint venture between Linköping University and the Swedish Meteorological and Hydrological Institute (SMHI) in Norrköping. She is also a Guest Researcher at the Physical Resource Theory research group within the Dept. of Energy and Environment at Chalmers Institute of Technology, Göteborg, and a member of the Steering Committee of Tellus, a Science Faculty Platform at Göteborg University. More information on her current research at CSPR. Madelene Ostwald is also Research leader for the national Swedish research network Focali – Forest, Climate and Livelihoods (with its office at Physical Resource Theory at Chalmers University of Technology in Gothenburg). Focali focuses on forest/bio-energy, climate change and poverty issues. Several Swedish universities and institutions are represented in the network. Focali is a part of The Forest Initiative – a strategic partnership between the Swedish International Development Cooperation Agency (Sida), the Swedish Forest Agency, and the Swedish Forestry Association. Madelene Ostwald has coordinated a major research project titled ”Land use, land-use change and forest (LULUCF) in an extended context beyond Kyoto”, a project that is funded by the International Climate Politics program at the Swedish Energy Agency(STEM). The project included field work in both South India and Sri Lanka (photo to the right from Karnataka) . The other participants in the project were PhD candidates Matilda Palm and Eskil Mattsson in the Dept. of Earth Sciences (more information about them below); Assistant Professor Göran Berndes from the Division of Physical Resource Theory, Dept. of Energy and Environment at Chalmers University of Technology; Prof. N. H. Ravindranath from the Centre for Ecological Sciences, Indian Institute of Science (IISc) in Bangalore, India; Dr. S.P. Nissanka from the University of Peradeniya, Sri Lanka; and Dr. John Reilly, Senior Lecturer in Behavioral and Policy Sciences (BPS) at the Massachusetts Institute of Technology (MIT), Cambridge, USA. Abstract: By means of an integrated approach, tsunami affected land, vegetation and inhabitants were assessed to evaluate the potential to restore coastal land in the context of Kyoto Protocol’s Clean Development Mechanism in Hambantota district in the south-eastern part of Sri Lanka. Firstly, assessments of the status of the tsunami affected area was carried out by collecting soil- and well water samplings for carbon and salinity analysis. Secondly, identification of potential tree species for Clean Development Mechanism and biomass measurements of different forest types was conducted to determine their carbon stock and suitability to grow under the prevailing soil status. In addition, by performing interviews the local people’s perception of forest plantations was established. The results showed that the resilience process of salt intruded lands from the 2004 Asian tsunami has progressed rapidly. The salinity level in the soils was low throughout the district but while the well water showed evidence of salinity contamination. The carbon stock was highest in the mature natural forests and second highest in coconut plantations. Several land users could imagine expanding their present plantations or establish new ones. The barriers were defined as lack of financial investment capital and limited land for extended plantations. If establishing a Clean Development Mechanism project the coconut tree was found to be the most feasible tree species since it has a high carbon content and was the also the species that was least affected by the tsunami. It also possesses a salt-tolerant characteristic that is valuable as well. It was found that the inhabitants in the study area are dependent of this tree for sustaining a livelihood. Seen from a Clean Development Mechanism perspective the assessment of multi-functionality of forest plantations as seen in this tsunami prone area should be considered to increase their attractiveness of such projects. In February 2006 Madelene Ostwald received SEK 50 000 as a SASNET planning grant for a project on ”Climate Change and Climate Collaboration between Peradeniya and Göteborg University. The Potential of using CDM (Clean Development Mechanisms) in land and vegetation recovery after the 2004 tsunami in southern Sri Lanka” The project has been carried out in collaboration with Dr. Nissanka from Faculty of Agriculture, University of Peradeniya, Sri Lanka, with an aim to increase the already flourishing collaboration on education and research between Earth Science Centre, Göteborg University, and Peradeniya. CDM is an abbreviation for Clean Development Mechanism, one of the flexible mechanisms under the Kyoto Protocol. CDM is designed to help developed countries to meet their GHG emission limitation commitments and to assist developing countries to achive sustainable development, while at the same time generate certified emission reductions (CERs) for use by the investor. This includes projects within the field of Sinks projects (afforestation and reforestation). This research project has focused on this, including forests and plantations. Dr. Matilda Palm has been involved in the project on Climate Change and Climate Collaboration. Her research has focused on forest based CDM projects in India, impact assessments of present regulation, and analysis of the prospect for establishment of forest based CDM projects in southern India. She defended her doctoral dissertation entitled ”Land Use in Climate Policy – Forest Based Options at Local Level with Cases from India” on Friday 27 November 2009. Faculty opponent was Associate Professor Emily Boyd from the School of Earth and Environment, University of Leeds, UK. More information, with link to full-text thesis. Matilda Palm is now working as a post-doc at Division of Physical Resource Theory, Department of Energy and Environment at Chalmers University of Technology. She is also connected on a part time basis to the World Agroforestry Centre (ICRAF) as a researcher where she conducts technical coordination of field activities for the project Rewards, Use and Co- Investment for Environmental Services (RUPES) in Vietnam. More information on Matilda Palm’s research. 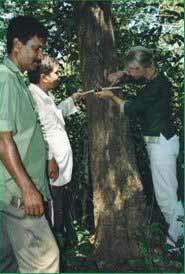 The 2009 PhD thesis was based on fieldwork conducted mostly in the south Indian state of Karnataka, in collaboration with the Centre for Ecological Science and the Centre for Sustainable Technologies at the Indian Institute of Science (IISc) in Bangalore. There she worked under the supervision of Professor N.H. Ravindranath at IISc, and besides she also worked as a consultant for the UK firm Ecosecurities. The thesis combines five separate papers and results in an improved understanding of the local, regional and global implications of different initiatives on land use change. It also analyses the environmental and socioeconomic effects of different efforts, both theoretical and practical. The research presented in this thesis was motivated by a perceived lack of local case studies exploring the contexts of climate policy. The results in this thesis confirm that the performance of individual forest-based project activities will depend on local conditions, for example land availability and local acceptance. Eskil Mattsson defended his PhD thesis in Physical Geography entitled “Forest and land use mitigation and adaptation in Sri Lanka – aspects in the light of international climate change policies” at the Department of Earth Sciences on Friday 30 March 2012. The faculty opponent was Dr. Sandra Brown, Ecosystem Services Unit, Winrock International, Virginia, USA. Eskil Mattsson has now, just like Matilda Palm, moved to Chalmers University of Technology, where he is based at the Division of Physical Resource Theory, Department of Energy and Environment. The dissertation project at University of Gothenburg formed part of the STEM funded project on ”Land Use, Land-Use Change and Forestry (LULUCF)” described above. Eskil Mattsson’s esearch focused primarily on the role of land-use change and forestry in a future climate regime with emphasis on reducing emissions from deforestation and forest degradation, conservation, sustainable management of forests, and enhancement of forest carbon stocks (REDD+). The aim of the dissertation project was to investigate monitoring aspects to deforestation and degradation in developing countries, with a focus on Sri Lanka. The findings presented in the thesis can contribute to a better understanding of potential options and approaches that Sri Lanka can use to realize its climate change mitigation and adaptation potential in the land use and forestry sector. More information about the thesis, including an abstract and link to the full-text thesis. Eskil Mattsson has received a small research grant by the Centre of Globalization and Development at the University of Gothenburg for continued research in Sri Lanka. The aim of his coming post-doc project “Multi-functionalities of land use in Hambantota district, Sri Lanka – synergies of adaptation and mitigation to climate change” is to investigate which methods that can be used to explore if locally accepted land use systems in Hambantota district have the potential to serve several purposes: to mitigate the effects of climate change by sequestering carbon and to increase adaptation by extending and intensifying land-use to low-productive and degraded lands for potential environmental benefits such as protection against natural hazards and increased income from higher productivity of the lands, food security and providing timber supply. The project should be carried out together with Dr. Madelene Ostwald and Dr. S.P Nissanka at the University of Peradeniya, Sri Lanka. More information on Eskil Mattsson’s web page.